Craig Williamson is a New Zealand based musician with varied interests. There’s the heavy stoner-psych persona, manifested in the late 90s – early 2000s via the band Datura, and more recently Arc of Ascent. And since 2001 Craig has released albums as Lamp Of The Universe, characterized by ultra trippy Eastern influenced psychedelia. The latest outing is Transcendence, released by the German based Clostridium Records label in a beautiful glossy gatefold package, pressed on 180g vinyl, hand numbered, and includes an arty button. 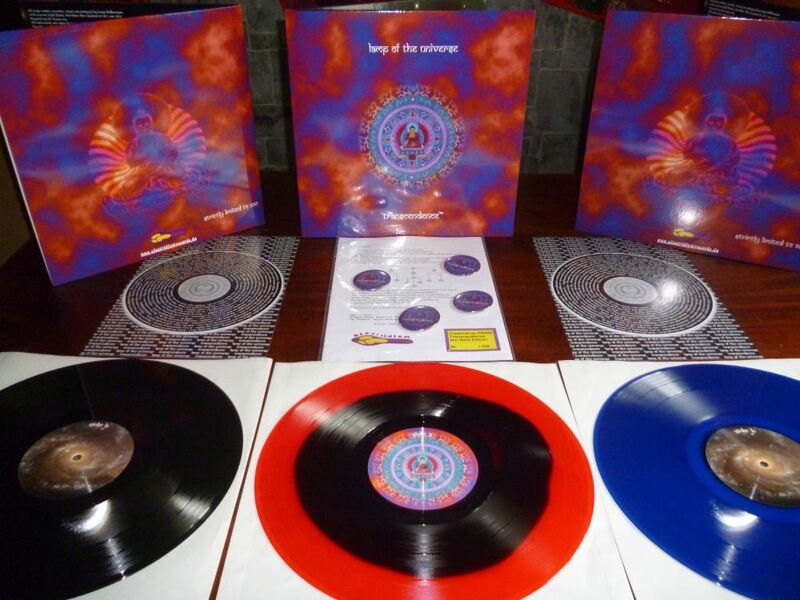 It’s in an edition of 500 with 200 black, 200 blue, and 100 split red-blue. It’s also available as a digital download album. Lamp Of The Universe is a solo project, and on Transcendence multi-instrumentalist Craig employs an arsenal of instruments including acoustic and electric guitars, bass, drums, djembe, sitar, tanpura, recorder, Mellotron M-400, Rhoads piano, synths and vocals. Side A opens with Pantheist, and right out of the chute we’ve got the heaviest music I recall ever hearing on a Lamp album. It’s got a doomy vibe, with stoned psychedelic efx’d guitars and orchestral keys, which are offset by Craig’s trademark hypnotic Om chant pied piper vocals. At 8 minutes there are plenty of instrumental breaks, my favorite of which is the combination of heavenly keys and liquid psych guitar solo. Creation Of Light is next and now we’re in classic Lamp territory, dosed with sitar, recorder, trance inducing Rhoads melody, ethnic percussion and Craig’s mystical lyrics. Transcendence closes out Side A, finding a middle ground between the first two tracks by taking a lighter stoner vibe than Pantheist as its core and creating a cosmic journey to the East, rocking out with sitar, slowly soloing but dirty rocking electric guitar, and spacey symphonic keys, and I like how when the electric guitar is in the lead the sitar supports by easing into a mesmerizing drone. The Sign Of Love opens Side B and is dominated by drugged strumming acoustic guitar and somber Mellotron, which injects a wee bit of an In The Court Of The Crimson King vibe to this narcotic song. Samsara is the most stripped down song of the set, with Craig singing to acoustic guitar and chirping birds. The album concludes with the nearly 11 minute Beyond The Material World, which features the most acid drenched music I’ve ever heard on a Lamp album. It rocks hard in a peacefully drifting way, with a light stoner core, absolutely killer acidic, wah’d and winding electric guitar, tripped out alien effects and Mellotron. In summary, this is hands down the best Lamp Of The Universe album I’ve heard yet. I love the blend of heaviness and psychedelically spaced out trippy music. Listening to this begs a DAMN, is Craig really doing all this himself? I’m impressed. Put on the headphones and fire one up.